The drop in home sales in recent months has been explained by a lack of inventory. If there are fewer houses for sales, it stands to reason that fewer houses are going to be sold. But real estate marketplace Zillow reports there may be another reason. Houses are simply not as affordable as they once were, especially in the nation's largest housing markets. Zillow looked at the top 35 housing markets and discovered that to buy a median-valued home in more than half of them will require a bigger chunk of a homeowner's paycheck than in the past. In addition, the larger down payment that come with a more expensive purchase is also proving to be a roadblock for many would-be buyers. This is not a situation that exists everywhere. Nationwide, Zillow reports the median-priced home for sales only requires 20% of the median income. The falling inventory of homes, a reason for lower sales, is also contributing to higher home prices. It's a simple matter of supply and demand. With a smaller supply of homes, sellers can ask for more, and if they are in a desirable housing market, usually get it. The Zillow analysis found that the Los Angeles housing market requires the largest share of income to make the monthly mortgage payment on a median-priced home. The typical LA area home requires 46.8% of the median income for the area. That's up from 35.2% before the housing bubble. At the other end of the scale, the median-priced home in the Cleveland area is very affordable. The median list price of $144,000 requires only 12.7% of the median income to make the payments. Before the housing crash, Cleveland homeowners were paying 20% of their income to pay for the typical home. 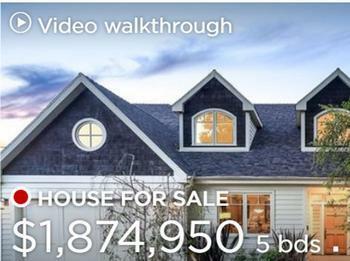 Zillow also reports nationwide, valuations seem to have gotten out of whack. The nationwide median home value is $197,000. Yet when you single out all the homes for sale, the median asking price is nearly $247,000. This situation exists at a time when mortgage rates are historically low. After rising above the 4% mark early in the year, the average rate on a 30-year fixed-rate mortgage has fallen below 4% again. The affordability issue would likely be much worse if mortgage rates were to approach 6%, where they were during much of the housing bubble.